Getting a child to quit slouching and stand up straight is a common struggle for parents. 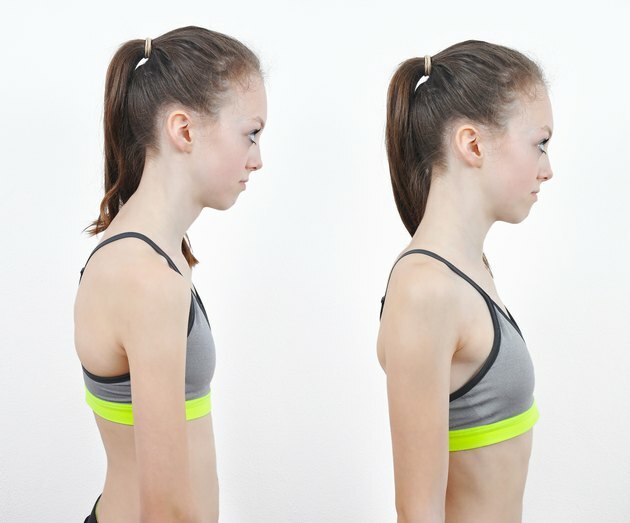 A child’s poor posture not only looks bad, but also affects her health both today and down the road. A little focus and some fun ideas will help your child enjoy the benefits of good posture without the nagging, enabling you both to relax and making bad posture a thing of the past. According to Child and Youth Health, posture is the manner and position in which your child holds his head, neck, back and spine, as well as his arms and legs, when standing, sitting or lying down. Bad posture usually results from a combination of physical and environmental issues, such as leaning over to type at a computer that is too low. Children may also develop bad posture from an overweight backpack, according to the American Chiropractic Association, or, according to the American Academy of Pediatrics, through stooping in an effort to “blend in” with shorter peers. Poor posture also results from weak abdominal and back muscles, often due to underuse. The effects of bad posture on your child can be more than how unattractive it looks. Neck and lower back strain or carpel tunnel syndrome are common concerns, and poor posture can also lead to long-term issues, such as abnormal bone growth, which is hard to correct over time. Be sure to mention your child’s bad posture to her pediatrician if you believe her slouching may be a result of a medical issue, such as scoliosis. Child and Youth Health states that good posture is when your child’s back has the least amount of strain placed on it through keeping bones and joints aligned properly, allowing muscles to be used properly as well. Good posture naturally happens when the upper body’s muscles are balanced in strength and used uniformly. So, the good news is proper posture can come from mindfulness of body alignment, plus daily exercise your child probably already loves, including riding his bike, running and playing sports. To help your child achieve better posture without constant reminders from you, try to make it fun. Besides daily activity, have your child watch TV or play computer games while sitting on a stability ball, which strengthens her core. Make it easy for your child to use correct posture by making sure her desk, chair and computer are appropriately sized and aligned and by keeping her backpack to no more than 10 percent of her body weight. What Age Do Children Learn to Ride a Bike?